Jason is the primary customer contact for our landscape maintenance accounts. His accounts include all our regional residential clients and most of our in-state commercial properties. Jason develops relationships with our customers based upon frequent, effective, professional, and timely communication, developing our customers’ confidence in our ability to meet their landscape expectations. Familiarity with his clients and their gardens gives Jason ongoing opportunities to identify ways to fine tune our landscape management services and to suggest enhancements that a garden’s maturation might dictate. Jason manages properties with the goal of being the first to see a problem and to provide a solution for it. Jason works to define solutions that are in line with the customer’s aesthetic goals, practical needs and that are within specified budgetary parameters. As a manager, he communicates contract specifications to our maintenance crews and works with them to perform quality services in an efficient manner. He monitors activity of crews and works closely with production and administrative staff regarding scheduling. Jason provides training in proper equipment use and landscape maintenance techniques and coordinates regular, companywide safety training sessions. As a member of the National Association of Landscape Professionals and Urban Ag Council, Jason maintains a thorough knowledge of industry trends and best practices. He joined FGC in 2011 as Landscape Maintenance Project Manager for Magnolia Trace, a continuing care retirement community campus in Huntsville, Ala. In that position, Somerville supervised the maintenance of the 43-acre ACTS Retirement-Life Community. Now at our Gainesville office, with many accounts both commercial and residential, Jason enjoys the expanded variety in his work. He appreciates how each garden reflects the personality of its owner. Jason collaborates with our garden designers to insure the gardens we maintain stay true to their original design intent and that, as the landscapes mature, they reflect our company’s creative standards. Jason started his career in the landscape industry in 2002 managing the Southern Living Garden at the Birmingham Botanical Garden. 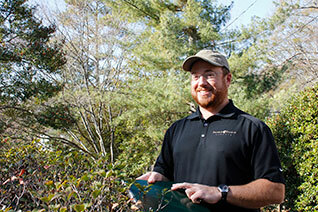 He holds a horticulture degree from Clemson University with a minor in urban forestry.